"MotoGP is man and machine on track alone. The rider decides tactics, as opposed to Formula One. I'd like to keep that philosophy"
An exclusive interview with MotoGP Race Director Mike Webb, focussing on the forthcoming introduction of 'virtual pit board' technology, which will allow messages from team-to-rider via the dashboard. There will also be a new camera system to monitor track limits during the 2017 season and dashboard warnings for riders that are in danger of penalty. 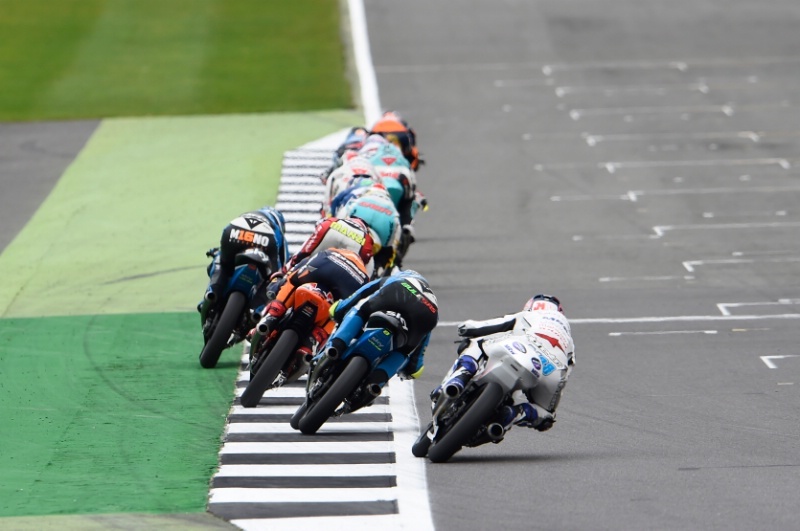 Meanwhile, Race Control will continue to clamp down harshly on riders slowing to find a tow in practice, a problem in the smaller classes, rather than change the qualifying format. 'Virtual pit boards', in the form of team-to-rider dashboard messages, are being developed to compliment real pit boards in MotoGP 2017 (pic: Gold&Goose). 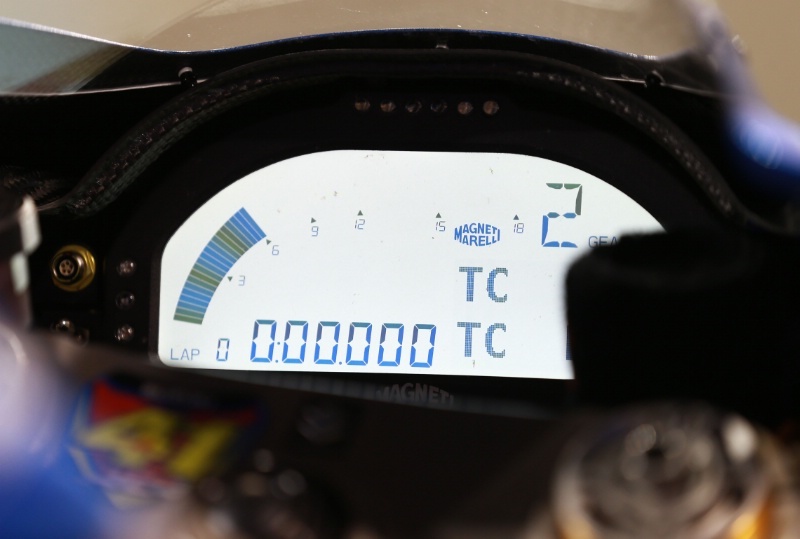 Is the system for sending dashboard messages from teams to MotoGP riders ready to be used this season? "The technology itself is ready, but we are continuing to get agreement from all the teams - which includes the riders - about what everyone actually wants, within the envelope of what is possible. There are some teams and riders who say 'we don't actually want it' and others who say 'yes, this is a good tool, let's use it'. So it's not finalised yet. "What I can say is that it will be a very short text message system, to be as clear and succinct as possible. And at the moment the proposal is to start with a menu system, with five or six stock messages available, if the team wants to use them. "Those five or six messages have to be defined by us. So it's not a write-what-you-like messaging system. It's a small choice of clear, succinct messages which are to do with weather conditions, when a rider needs to come into the pits. Things like that. "Maybe it will evolve into something more. Personally, I'm yet to be convinced that it's a great idea to have unlimited communication to the riders. So I'd prefer that it's limited and it will be at the start." "Yes certainly, but to be honest you have to remember that teams are communicating with their riders anyway with pit board signals. They can easily put a 'P2' on there, meaning drop back a place or something. "While I'm more concerned with the safety side - informing riders of weather changes - there is also a bit of philosophy involved in the messaging system, because a motorcycle grand prix is not an endurance race, it's a sprint race. "It's man and machine out there on the track alone, having a race, usually without pit stops, and it's up to the rider to decide their own tactics based on how they see the race track. As opposed to having a pit crew, like in Formula One, deciding tactics for them. "I personally would like to keep that philosophy of a motorcycle sprint race, where it's up to the rider to make their own decisions." What is the likelihood that agreement will be reached for the messaging system to be used in Qatar? "Personally, I think it's unlikely. As I say, the technology is ready to go, but it also requires that all the teams are updated to the latest version of the official software. [MotoGP director of technology, Corrado Cecchinelli: "Such an updated software will be available for testing at the Qatar test"]. "If it's all agreed and everyone is ready, it can be implemented. We already have the dashboard flag signals and it's the same electronics sending the signal for the messages. So from our side it's a done deal. "There was some debate basically between Dorna, IRTA and the teams on - first of all - do we even want this? And secondly, if we do, what format should it take? That part is not quite resolved yet. "But it may move ahead in time for Qatar and that wouldn't be a problem from our side." Is the format not resolved because some teams are pushing for the freedom to write their own messages? "Oh, the first request from almost every team is freedom to write their own messages - and that was more-or-less the first veto from me! Let's see how we get on with a menu of set messages, because the target was firstly always safety. So messages like; 'conditions are XYZ, you really need to change tyres'. That kind of thing. So with that target in mind, free messaging was the least of our priorities." You mentioned the philosophy of a motorcycle grand prix, is that also why you oppose free messaging from teams to riders? "I do still have reservations about free messages and even allowing the whole team-to-rider dashboard communication system. But I can also see some really good applications for it, from a safety point of view. So okay, let's go ahead, get it up and running and then as we get experience we can make it better and better." 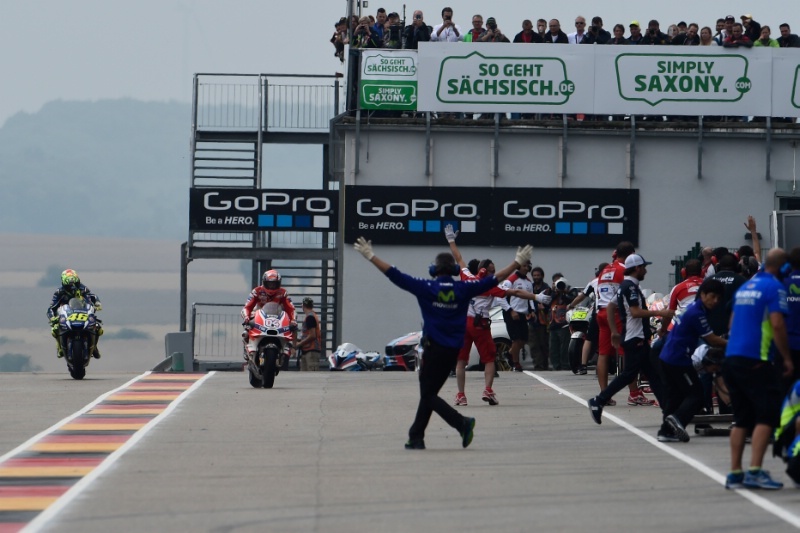 Dovizioso, Rossi, bike swap, German MotoGP Race 2016 (pic: Gold&Goose). Messaging aside, are there any new dashboard signals for 2017? "We're going to include a couple more, as the dashboard system grows. It's mostly for Moto3. "There's a new warning light for exceeding track limits. It doesn't mean a penalty, it means we've seen you exceeding track limits a couple of times, we'll consider it a mistake, but watch out because you're inline for a penalty. 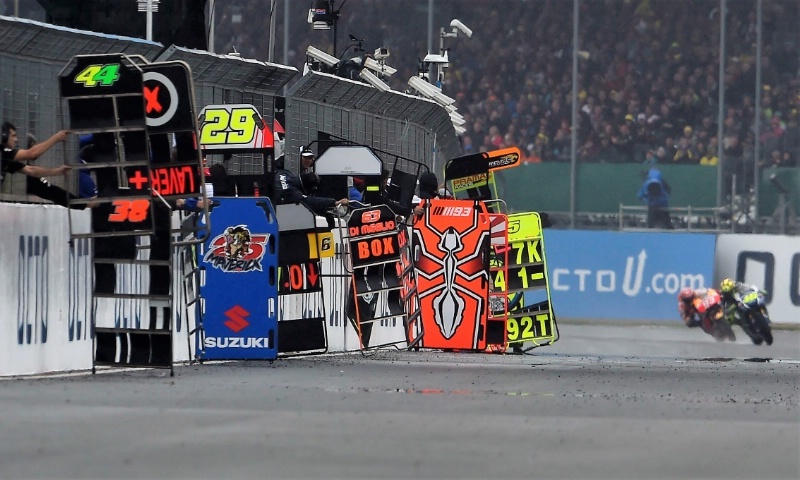 "We've already been signalling that warning manually during the last half of last year, by informing the team to give their rider a pit board signal. But we've now got it as a dashboard signal as well. It's a light with a bit of text saying what the message means. "Another new dashboard signal is for blue flags, specifically during a race for a rider who is about to be lapped. I'm not so bothered about qualifying and practice, but during the race I want to be very sure the leaders are not held up by a backmarker, so I'll give the extra signal then. "As with all the dashboard signals we will continue waving flags at the side of the track as well. "The blue flag signal is not automated, we still have to monitor and call it from Race Direction. So at the same time that we are contacting marshal posts to say 'be ready, there is a blue flag situation about to occur' we'll be deciding when and which riders to send the dashboard signal to." How do you monitor the track limits? "Track limits have been a growing problem because we've taken away a lot of artificial grass for safety. So we've got an automated, camera-based system, to be able to identify when a wheel is out of track limits and display the information to us straight away. "We will still review it and decide if it is a penalty or not, but we're basically speeding up our operation. Rather than having dozens of eyes watching cameras all over the place, we've got a signal being sent to us automatically saying, 'hey, look at this'." British Moto3 Race 2016 (pic: Gold&Goose). Were you using that dedicated camera system last year? "There was some early testing last year, but it's new for this season." And it'll be ready to use right from Qatar? "For sure. The level of how well the software works for detecting what's outside of the track limits and what is not will be a work in progress. But the good thing is we'll have dedicated cameras on the trouble spots, whereas before I was relying on having a Dorna camera that happens to be in the right place to watch the trouble spot. The big step forward for me is that we'll have our own cameras, just for that task. They are not panning somewhere else, they are dedicated just to track limits." They are like closed circuit cameras? "Exactly, we can still move them if we want, but the point is every circuit has got known trouble spots. Some, thank goodness, don't have any! Some, like Silverstone, have lots. We'll focus on the known trouble spots straight away and for the occasional situation that's in a really unusual place, we'll still rely on a marshal to point it out to us." "A huge variation. During practice it's really easy because all we are doing is cancelling that lap time, saying it's an illegal lap. So that's very automated and relatively simple. Our guy who has observed it more-or-less pushes a button, then time keeping gets the signal and cancels the lap. "During a race there's a lot more judgement involved from us, usually either; 'okay, he's made a mistake and gone off track, but hasn't gained an advantage'. Or, 'he's made that mistake too many times...' Or, 'he's clearly gained an advantage'. "If it's a clear situation - live feed, a rider goes outside track limits and gains ground - the penalty is instant and the rider knows within a minute. Then we've got much, much slower track limit penalties where we get a marshal report about a rider who perhaps is not in the front group, not always on camera. "So then we have to verify it by finding the video of that incident and then, if necessary, issuing the penalty. That can actually be a number of laps later in the worst possible case. "So there is a variance in detection. The new automated camera system we've got uses software that determines the track limit, when an object has gone out of that limit and then relays that image to us so we can assess it straight away. "We still have to judge if it was an infringement or not, but at least it stops us waiting for a marshal to call in on the radio, 'can you look at turn 12, one lap ago'. It's just speeding up the process that we already follow by using the latest technology." Binder, Aragon Moto3 2016 (pic: Gold&Goose). 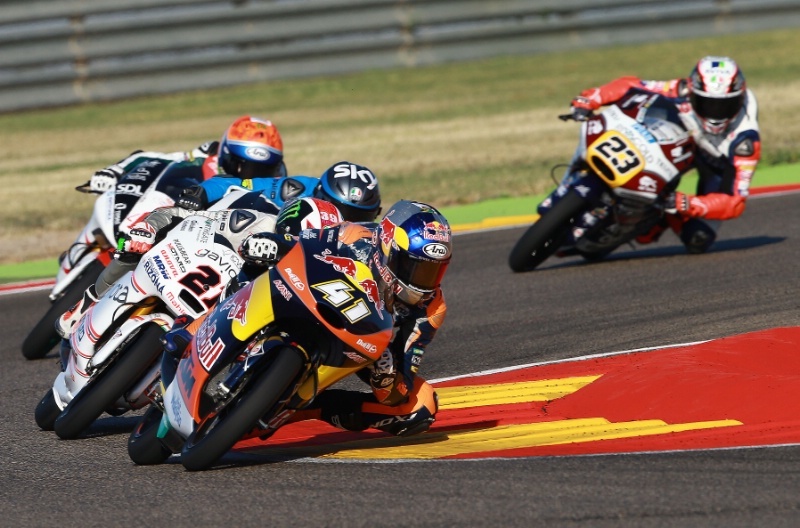 The Moto3 'towing and slowing' saga was a headache again for you last year. Is the message getting through, now that the penalties have been ramped up? "That helped a lot. There was a big change in behaviour. But we noticed the first time we started doing penalties, there was a big change in behaviour at first and then it crept back again. The shock value wears off. "So later in the year we said, 'right, now you are going to get a serious penalty if you do this' and we are still at a reasonable stage of behaviour at the moment. So we'll keep going as it was at the end of last year, with those penalties being applied ruthlessly. "The final option is to change the format of qualifying and I really don't want to do that. So I'm trying to do everything other than that. Let's see how we get on." Changing the subject completely Mike, how did you start in motorsport and get to where you are now? "30 years ago I was doing national level club racing in New Zealand - roaring around, having a great time! - and I also owned three motorcycle shops at one point. "I won the New Zealand national championship a couple of times. One year I won the GP 250 class, winning every race except one, when the bike broke down. So I thought 'whoa, I'm good at this!' and I got a wild-card entry for the 1989 Australian Grand Prix, the first at Phillip Island, on my standard 250.... And was dead last! In fact, the bike broke two laps before the end of the race! "That was almost the end of my racing career because I was getting old by then, but still having loads of fun and I thought, 'I can do this. I'm pretty good at it'. But then to realise the difference in level between national racing in New Zealand and world class Grand Prix. It's night and day. "The wild-card was a great experience, but together with my age - I didn't jump on a motorbike until I was 25, so I was close to 35 by then - and with no career beckoning it was the end of it. "It just kind of reinforced what I already knew; that I was having a really good time racing, loved it, but I wasn't destined to be world champion at that age. So it was pretty easy to decide to wind down the racing. Main pic: Mike Webb during the 1989 NZ championship on a Yamaha TZ250. Smaller pics, left to right: 1987 Production race, Yamaha FZR1000. 1988 street circuit, Yamaha TZ250. 1989 Australian Grand Prix Phillip Island, Yamaha TZ250. (Pics: Mike Webb). "Then Peter Clifford started a race team in 1992, when Dorna took over the championship. With Dorna taking over suddenly it was commercially viable to actually run a race team, whereas previously it wasn't. "So specifically because Dorna took it over, Peter Clifford and Bob MacLean started WCM and it happened that during the off-season in New Zealand I'd decided I wasn't going to race anymore. "That was that and I was a crew chief for 500cc Yamaha teams for the next ten years." You went straight in as a crew chief? "Yeah, well there were only two mechanics, we shared all the work, but someone had to hold the clipboard! We used to have fun as a private team. 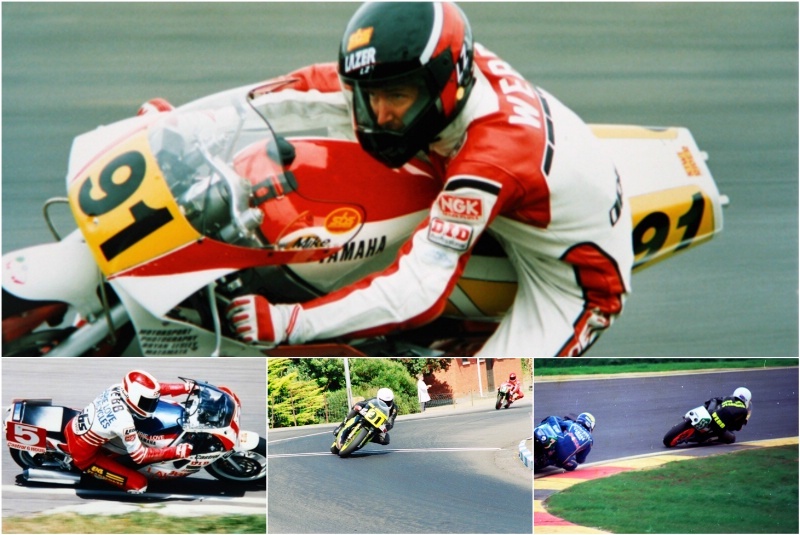 "Then after a few years with Peter and Bob at WCM, I spent one year in Superbikes because a good friend of mine - Simon Crafar - had got a factory Kawasaki ride. 'Please Mike come and help out', so I did that for one year and very quickly went back to GPs and was lucky enough to sign up with Wayne Rainey's team. "Wayne had just come back from his injury and was running the Yamaha team. So I joined Team Rainey and from then on, up until the last year of the 500s, I worked with the factory Yamaha team as a crew chief." Which riders did you work with at Yamaha? "Norick Abe, when I first started with Wayne. Then when Wayne basically sold the team to Yamaha and went back home, it became Marlboro Yamaha run by Yamaha Japan and I was working with Carlos Checa. So those two riders in the factory team." Norick Abe at Rainey Marlboro Yamaha, 1997-1998. (Pics: Gold&Goose). 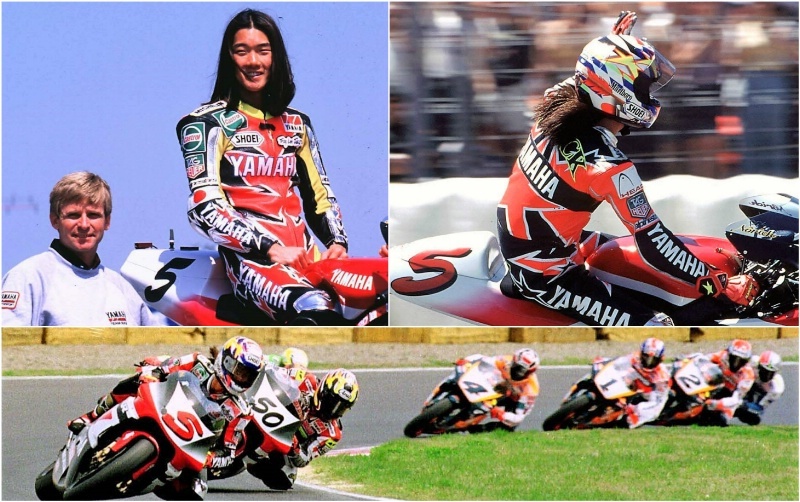 What are your main memories of working with Abe, Checa and Rainey? "Well first Wayne, what a privilege to work with that man and his team. Not just the legendary stuff, three times world champion and all of that knowledge and skill, but the fact that he is a genuine good guy with a great sense of humour. "To have him in the garage was a huge help to the riders and really lifted every one of us in the team. The team spirit was amazing. I still keep in touch now that he's involved in running the MotoAmerica national series in the US, and he's as passionate as ever about the racing and making sure everything is done right. "Norick was probably the nicest motorcycle racer I have ever met. I mean a genuine real nice guy. His talent was incredible, in the true sense of the word, meaning sometimes it was hard to believe. However it was also frustrating at times, especially for him, because he had this amazing talent but he wasn't always able to feel right on the bike. "It was like he was an artist; some days were incredibly good and the talent just flowed, but there were also bad days when nothing seemed to work. When everything felt right to him, it was amazing to watch. "Carlos was another super nice guy but there was also the hint of the fighter, the matador, in him. He trained hard, raced hard and a little crashing was never going to slow him down. Amazing feel on the motorcycle, he was always the fastest guy on track when conditions were difficult, like half-wet or a strange surface, he just used his ability and confidence to the maximum. "We struggled at times to give him a bike he felt comfortable on, but he never stopped putting in 100%, and when everything came together he was brilliant." 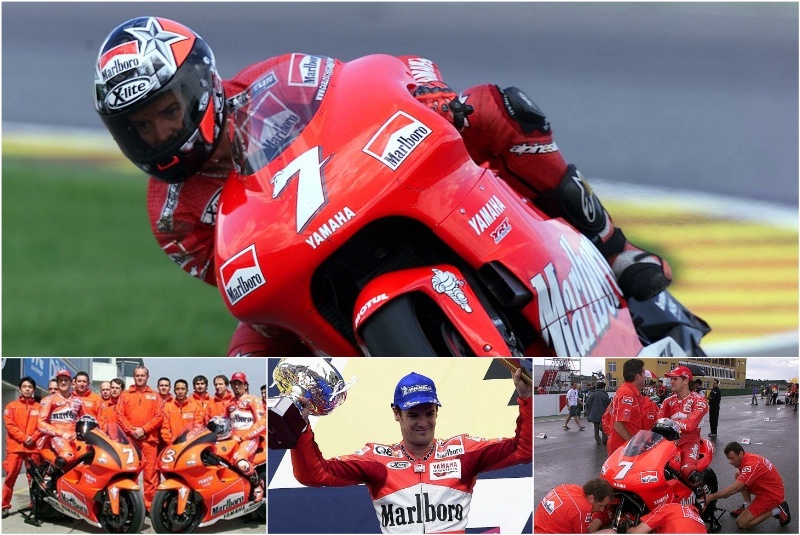 Carlos Checa, Marlboro Yamaha Team, 1999-2001. (Pics: Gold&Goose). Where did you go after Yamaha? "When 500cc changed to MotoGP in 2002 there was a huge staff change inside of Yamaha, with the new bikes and new everything. I left Yamaha at that stage and it just so happened that Jack Findlay had retired as Technical Director, so I moved in and filled that role. "I did ten years as Technical Director and then when Paul Butler retired as Race Director, it was 'Mike, you're Race Director'." Do you think the range of roles you've had, and also having been a competitor yourself, helps in doing your job now? "It's a huge thing. It helps so much that I've got a bit of an idea of what they are feeling on track. But because my racing experience is so long ago now, I rely on Loris Capirossi a lot in Race Control for up-to-the-minute MotoGP riding: 'A rider just did that, then that' - was it intentional or a natural reaction? I've got an idea, but sometimes for example Loris will say, 'no, in that position you have to roll off the throttle'. "So for the real, clear detail Loris is great. But for the general feeling of what happens on a racetrack and what racers are trying to do, I've got enough experience for that. Also, because of those roles over the years with various teams - not always working on the organisation side - you end up knowing most people in the paddock. "People know who I am and I know who they are. There's respect both ways. That helps a lot." 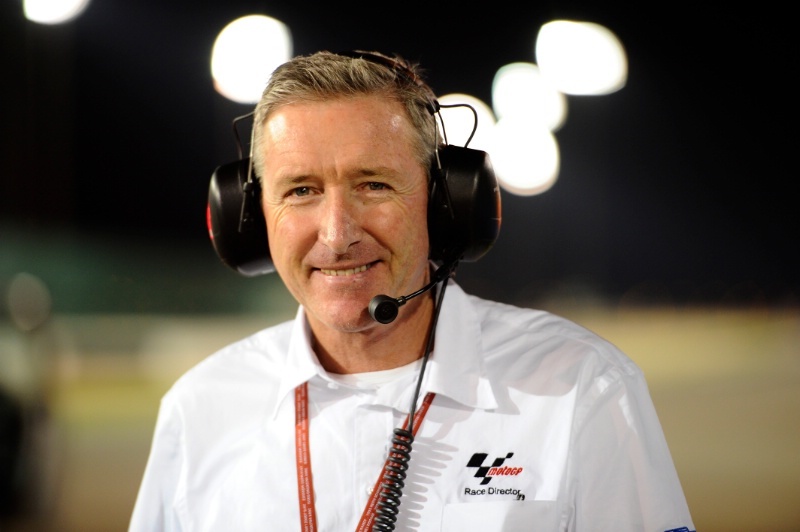 Mike Webb, Race Director, Qatar 2016. "Exactly. I've been that crew chief thinking, 'what are those idiots in race control doing!' We always try to be clear and consistent about what's going to happen, for example if a race is stopped and restarted." Do you get chance to ride a motorcycle now, between all of the travel for MotoGP? "Well, my riding is pretty limited these days and certainly no racing, but in some ways I've gone back to my roots of dirt bikes. I have a trials bike at home in Andorra which is the perfect place for a bit of rock climbing in the mountains, and there are great tracks just outside my back door. I also have a KTM Adventure bike so I can do a bit of back roads touring and see the countryside around Europe. "When I visit family and friends in New Zealand, my friends there always have a gravel road adventure lined-up for me in the summer, which is the perfect way to clear out the head ready for another season. I'm not really a road rider, but I have a handful of old '70s Japanese bikes in various stages of restoration, so I occasionally get out on one of those - and then remember just how bad they really were back in those days!" "A rider's expectation is always to win races..."